No Shed is an island. Who else is nearby? Into the She Shed yesterday floated in on the tide a couple from Oswestry on a holiday in Whitby. He was one of the founders of the Oswestry Men’s Shed in 2014. Early days in UK Shed terms. He brought an interesting story of how half a dozen men set the Shed up with £20 in an account and no premises. It was a statement of their intent which they worked through and won through. In the evening Graham was at another Shed. That’s what the Queen Bees Quilters call their abode at Newholme Village Hall. 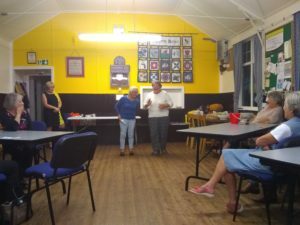 It was a presentation evening of donations to local causes and Graham attended with another Street Angel Barbara Geach. 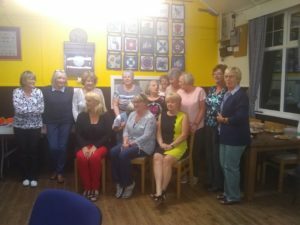 Street Angels Whitby received a very, very welcome £750 from the Queen Bees, along with Whitby in Bloom, Yorkshire Air Ambulance, Caring Together, Trinity Centre and the village hall itself. 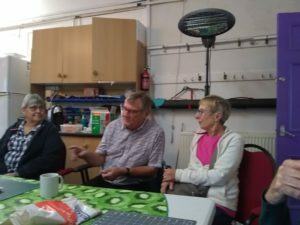 As Barbara and Graham walked in they were greeted and what was said almost immediately to them was that it is nor really quilting that held the group together and motivated them but the relationships for those who are otherwise somewhat isolated. They sought to raise funds for others. WOW. What an introduction. The evening was a quite remarkable evening because the focus was helping others. Street Angel Barbara receiving the cheque. Queen Bees in their hive. A fab group.